Our class has recently finished working on a tree planting project. Our C.S.P.E teacher, Mr Mayne organised the whole thing. We were all very excited when he announced that we were going to be doing tree planting for our Action Project. The trees came all the way from Claremorris. A retired teacher called Mr Pat Walsh started the initiative, because he says that “Ireland needs more trees”. He drove up to Cootehill with over 400 bare-root trees in the boot of his car on the 13th of February. So then it was the turn of the tree sorters; Jamie Bannon, Nichole Mc Gill , Francis Mc Cabe and Ciaran Bannon. Their job was to unpack all the trees and sort them into everyones’ individual order. There were five different tree species: Beech , Mountain Ash, Alder, Birch and Oak. Lastly, it was the turn of the diggers and planters. Dillon Mc Collom, Michael Mc Cooey , Des O Connor, Conor McCabe and Sean Carragher spent a drizzly, wet day up to their elbows in mud. Their job was to dig holes around the school grounds and plant our trees. 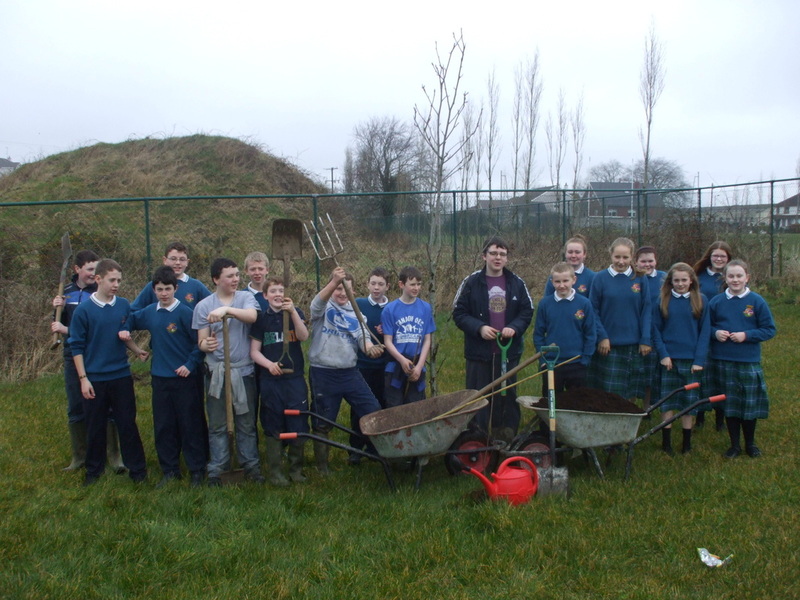 All the trees planted had been donated by generous staff and students of the school. In total, nearly 40 trees were planted around the school. Our tree planting project turned out a great success and we are really happy with all the work and effort put in to our project. We would like to thank our C.S.P.E teacher Mr Mayne for helping us with everything and the effort he put into the project. We would also like to thank our principal Mrs Smith for allowing us to plant our trees around the school grounds. In years to come we hope future generations will be able to see our trees.